This print is assumed to be from 1998, although it could be from as late as April of 1999. The run size corresponds to what BLK/MRKT was producing at that time, but is not confirmed. This print had been thought to be by Dave Kinsey due to the use of the "BLK/MRKT Man" in the background. However, it has been confirmed that it was done by Shepard Fairey. 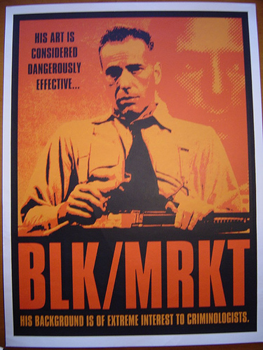 The BLK/MRKT website had referred to this print as "BLK/MRKT #8."